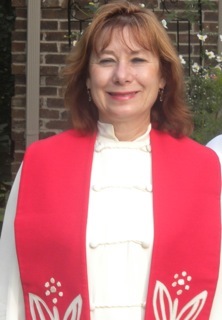 Janice Sevre-Duszynska is now a Roman Catholic Woman Priest with the Association of Roman Catholic Women Priests. She issued this Statement to the Bishops for Justice for Women in the Church in 2000. Unfortunately, they are still dragging their feet on the issue of women's ordination in a renewed priestly ministry in a community of equals as an issue of justice rooted in Jesus' example in the Gospels. "I'm here to use my voice for many who cannot speak. There is an injustice within our church that affects the whole world. We must address this wrong. I am calling you to bring about justice for women in the church. Women's Calvary has not been gentle -- since we are called by God to ordination. Be compassionate to your sisters. Take us women down from the cross and experience the liberating joy that comes from justice-making. Roll away the stone of fear from the tomb and your hearts. Brothers in Christ, hear and feel the Spirit in our midst -- calling you and all of us to deeper conversion. Believe us Easter morning women who are holy conveyors of God's sacraments to the world -- and as such must be given ordination. Believe us Easter morning women who have witnessed the Resurrection. What the Spirit desires is compassion and faithfulness to the Truth. These virtues are more important that mere obedience. Hide no longer in your fear. Believe us Easter morning women. Ordain women. Become Easter morning men...:"
Janice Sevre-Duszynska November 2000 -- USCCB, Hyatt Regency, Capitol Hill, Wash., D.C.
..."The current problem, however, is that Benedict and his immediate predecessor have made a real mess of the Catholic Church. He has failed to resolve in any significant way the priest sexual abuse scandal. Apparently, the Vatican’s child abuse legal defense is overseen by a sole practioner from California. Nine months now after firing the head of the Vatican Bank in the midst of financial scandals, Benedict has not replaced him. Meanwhile, the Vatican is incurring losses daily from its tourist business due apparently to related banking restrictions from the Bank of Italy. Apparently, the same California sole practioner is also advising the Vatican on its European banking law problems.Given this track record of failures, how many Cardinals really want to leave their financial and legal fates over the next few decades to the papal candidate selected by Benedict and his incompetent Vatican clique. The next couple of years will surely see an increase in international criminal investigations of child abuse and financial misdeeds. The major Australia abuse investigation commission is just the beginning. President Obama will face increasing demands to establish a comparable commission as the still ongoing LA Archdiocesean revelations shock almost everyone. Moreover, beginning next Monday evening, February 4, HBO will begin airing initially in both English and Spanish the award winning documentary, “Mea Maxima Culpa”. This powerful and moving documentary tells of the alleged sexual abuse over several decades by a single Milwaukee priest of over 200 deaf boys. It also points out clearly the Vatican’s failures to curtail this. HBO reaches over 25 million subscribers in the US and many more in over 150 other countries." Presider: Let us affirm our faith. It is ludicrous that the Vatican is so threatened by our women priests' movement that it is excommunicating and expelling men like Tony Flannery and Roy Bourgeois from religious orders, both faithful, prophetic, male priests who are addressing sexism in our church. Neither priests have done anything wrong, unlike the the bishops who protected thousands of pedophiles. The Vatican has not issued any excommunications in response to these crimes. This is the real scandal that is rocking the church. Soon another shocking documentary, "Mea Maxima Culpa" which recounts the sexual abuse of hundreds of deaf boys in a Catholic School in Miluwakee will air on HBO. There is something very wrong with a hierarchy and aVatican that does not see the elephant in its own living room. Jesus would weep over the tragic state of the Catholic Church. Let us continue to work for renewal and a "holy shakeup" of our church. Roman Catholic leaders pay too much heed to insulating, justifying and protecting their priesthood and themselves. "...That may sound like an extreme assertion, but the new book by Wills, a Pulitzer Prize winner who has written extensively about Christianity and the church, says that at the start, Christianity not only didn’t have priests but opposed them. The priesthood was a subsequent tweak, and the same goes for the all-male, celibate nature of the Roman Catholic clergy and the autocratic hierarchy that this clergy inhabits, an unresponsive government whose subjects — the laity — have limited say.